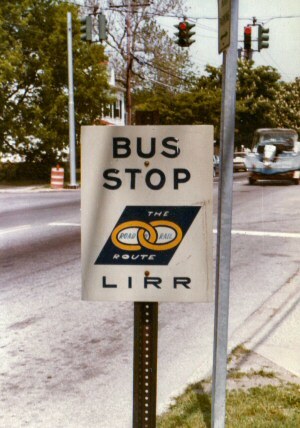 For some time, the LIRR had tried to attract customers on the East End. In 1955, an attempt was made to do this. A single-car prototype train ran along the Main Line to Riverhead, but this turned out to be a failure. 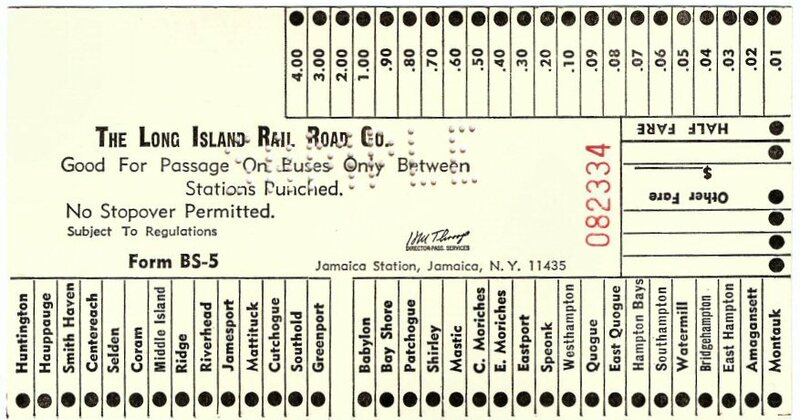 During the mid-1960s the LIRR lost mail contracts, which had justified service on the East End. 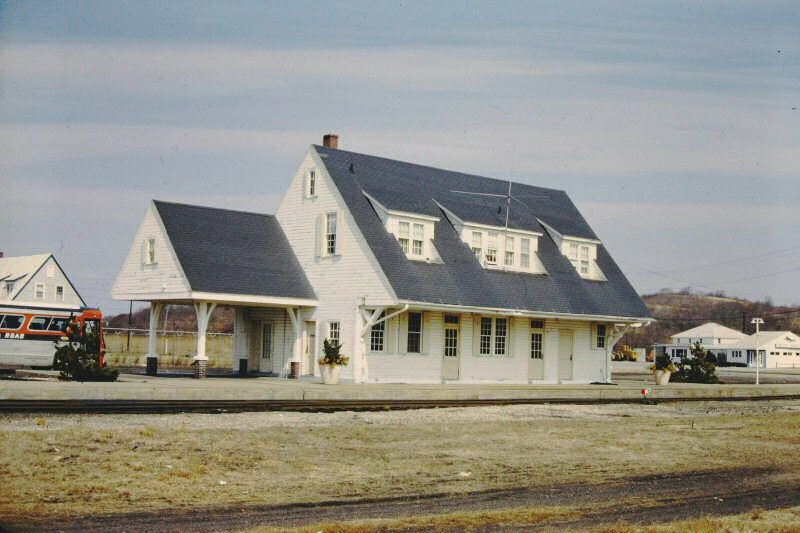 One way to continue service to these stations would have been to implement bus service, which could then replace certain train trips, reducing the need of maintenance on the Montauk Branch and Ronkonkoma Branch. The LIRR decide to do precisely that. 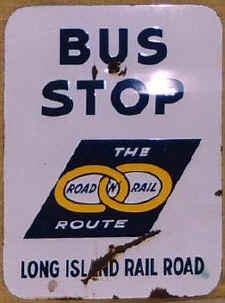 In the 1960s and 1970s, the LIRR operated a bus route between Greenport and Huntington as a combination "Road 'n' Rail" service, paralleling the Montauk Branch between Babylon and Montauk. Passengers on short trips were expected to be attracted to the buses as they were cheaper than rail, and because they ran through a heavily populated area that had no rail stations. An additional reason was competition. 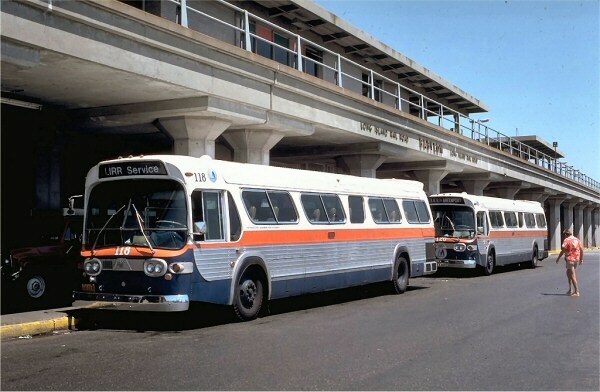 Long Island Transit Systems, Inc., at the end of 1960 sought permission to operate express bus service via the Long Island Expressway and New York State Route 25 between New York City and Riverhead, where it would continue easterly by arrangement with Sunrise Coach Lines, Inc. to Greenport. 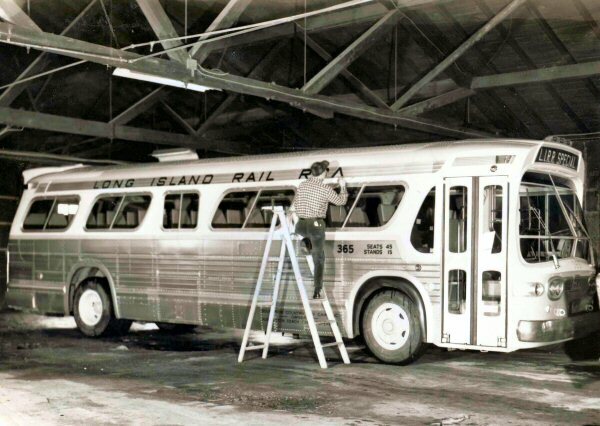 At around this time, the LIRR proposed its own bus plan, and in July 1961 the Public Service Commission (PSC) ruled that Long Island Transit's petition was not in the public's best interest. 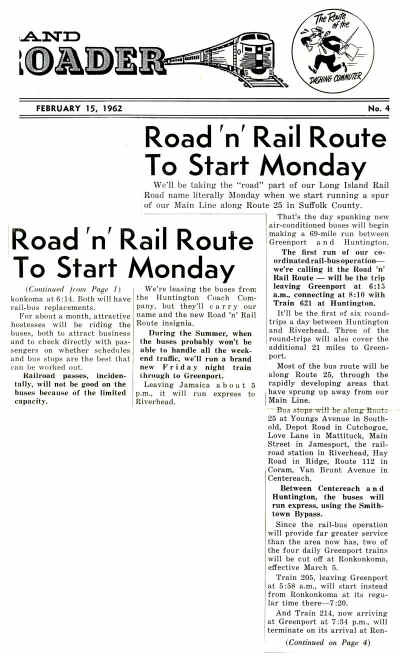 However, it would grant the LIRR’s proposal if the railroad received agreement from local governments along the route by January 18, 1962. 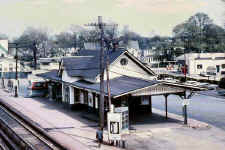 On January 17, 1962, the PSC authorized service as far as Southold and an extension to Greenport was granted later on. 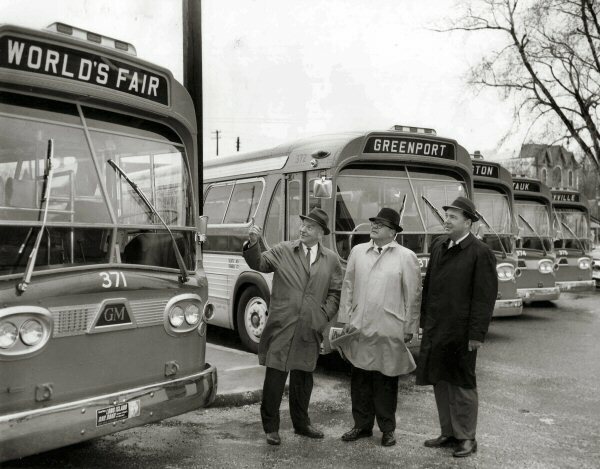 The buses first ran on Monday, February 19, 1962, with the desire to triple passenger service in Central Suffolk and the North Fork. 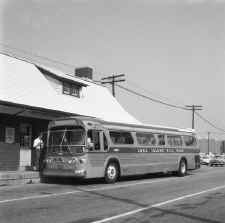 Because of its popularity, another bus route was initiated on the South Shore from Amityville to Montauk after approval from the PSC on May 10, 1963. This route ran along Montauk Highway from Shirley to the Shinnecock Canal. Six round trips a day would supplement rail service, and four new air-conditioned buses were ordered. Bus service began on this route on June 8, 1963. 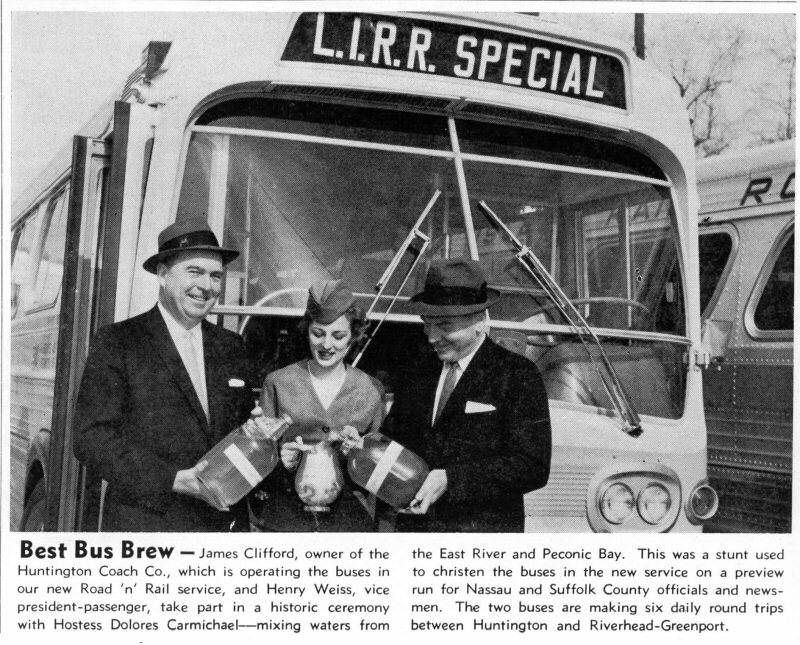 The new plan replaced trains with six daily bus round trips between Riverhead and Huntington, half of which went on to Greenport, and two round trips on the weekend between Greenport and Huntington, where connections could be made for train service to New York. Bus service was one way to continue service to eastern stations, replacing certain train trips, and therefore reducing schedules. In turn came reduced maintenance, and extended trip times. The LIRR, with the bus service implemented, was allowed to discontinue one westbound train out of Greenport and one eastbound to Greenport. 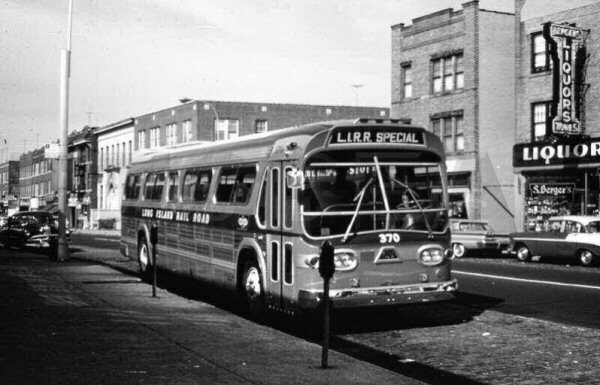 These buses also served new communities along New York State Route 25 in Central Suffolk, which were three to five miles from Main Line stations. This brought the railroad to passengers rather than having them travel to the railroad. 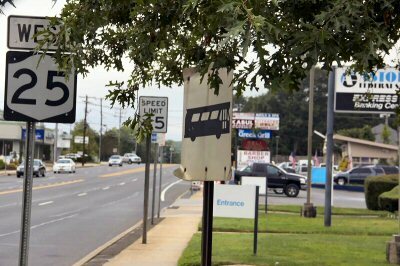 In order to save time, buses ran express along the Smithtown Bypass. 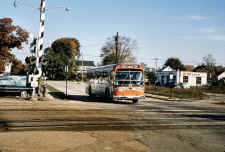 Zones were established by the PSC in order to prevent competition with local bus routes. The area between Huntington station and Deport Road and Jericho Turnpike was Zone one. The second zone was Jericho Turnpike between Larkfield Road and Veteran’s Memorial Highway. Middle County Road between Stony Brook Road and Evergreen Avenue was the third zone. The fourth zone was along Middle Country Road between Evergreen Drive and New York State Route 112. The fifth zone was from Riverhead to Greenport. 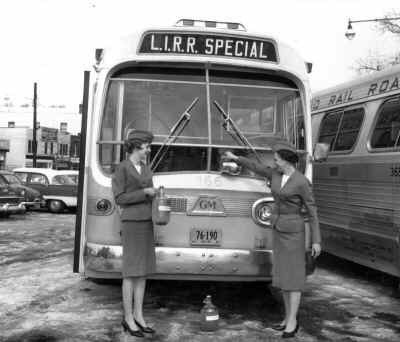 The original Road n' Rail buses were operated under contract with the LIRR, by Huntington Coach Corporation. In June 1973, the Metropolitan Suburban Bus Authority (MSBA) became the owner of LIRR Road n' Rail, and the "Town of Huntington" took over Huntington Coach routes as Huntington Area Rapid Transit (HART). The bus route primarily traveled along New York State Route 25 Jericho Turnpike. There were six bus trips each way weekdays, and four on the weekends. 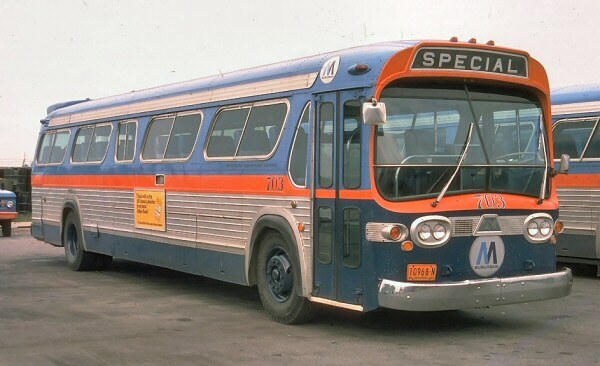 It was Spring of 1974, and the Metropolitan Suburban Bus Authority, aka “MSBA” had been operating Nassau County's Bus System for 10 months, with the exception of LIRR’s Road n' Rail buses from Babylon to Montauk & Greenport. 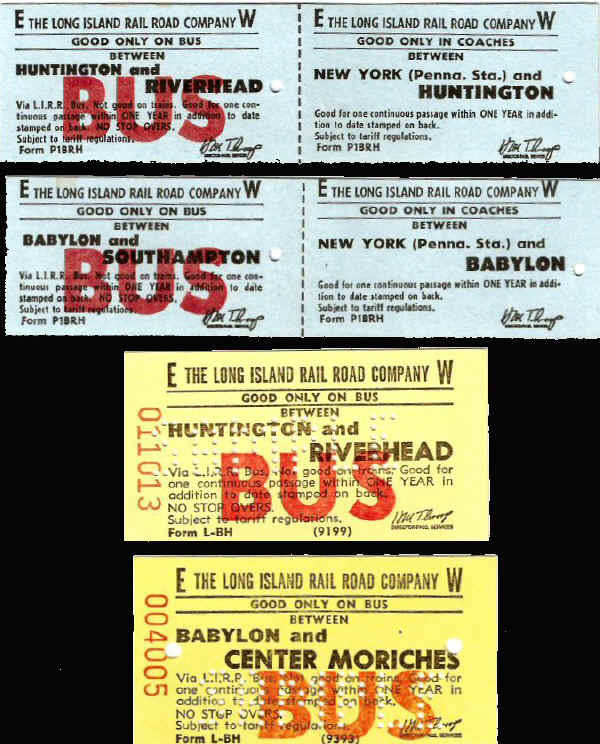 Note: The original Road-n-Rail buses were operated under contract with LIRR, by Huntington Coach Corp., From Huntington Station to Greenport, and from Amityville to Montauk. 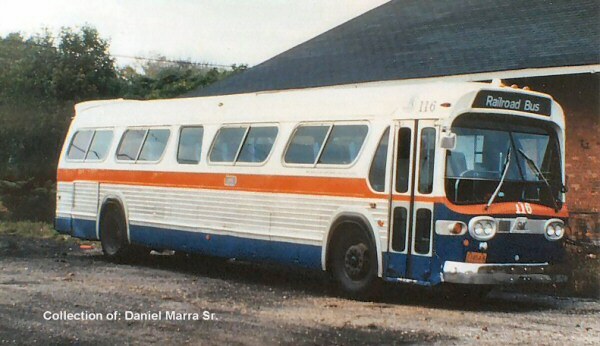 Some of the buses bore the name “Bay Hunt” on their sides, for, I believe, tax purposes. MSBA contracted with Schenck Transportation to continue operating the two routes until MSBA could purchase new GMC Suburban coaches for the Road n' Rail, and Charter operations. 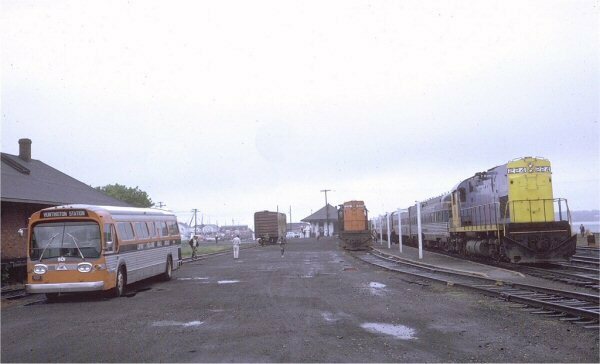 Photo: LIRR Road-n-Rail #500 c.1972 The freight building at the right is today the home of the RMLI Greenport facility. The vehicle has a 1966-1973 era NY Blue license plate on the 1970 Ford Torino. 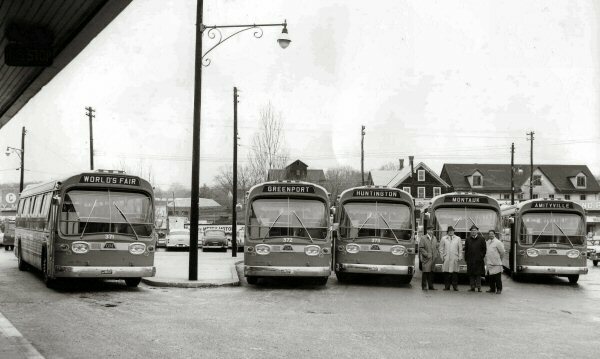 Note: Huntington Coach Corp., was the original Road n' Rail operator, of which Schenck was a partial owner. In June 1973, MSBA became owner of LIRR Road n' Rail, as “Town Of Huntington” took over HC routes as HART (Huntington Area Rapid Transit). The Summer (July & August 1974) MSBA Run Pick was posted first week of June. I was fairly high in seniority, and picked an open early A.M., run on Babylon-Greenport with a 4:00 am report time at MSBA’s Zahn’s Airport Depot in North Amityville. Pull out time at 4:10 am leaving Babylon Rail at 4:30 am (contingent on arrival of the connecting train from NYC Penn Station) arriving Greenport at 5:50. The train was only late once, but at 0430 there was very little, almost non-existing, traffic and easy to make up the lost time. 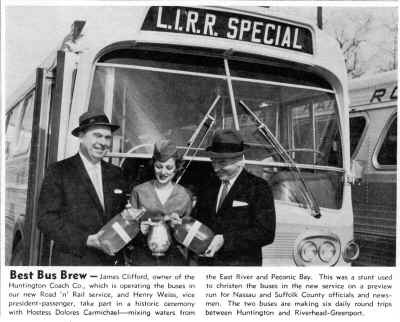 Babylon-Greenport was the best of the two Express routes like driving “Over-The-Road” through New England towns. At Schenck; I always preferred the long distance charters and Greyhound + Adirondack Trailways rental jobs, as opposed to local transit runs. The Road n' Rail route was nice, but it had its good, and bad points. Leaving Babylon, the route went east on Union Blvd, north on NY Rte 231, to NY Rte 27 (Sunrise Highway) east. Back in the early 1970’s, the new six lane limited access portion of NY 27 ended at Saxon Ave Bay Shore, then it was down to four lanes & traffic lights for about 12 miles. After NY Rte 112 (Patchogue), it was back on the new Four lane highway for 25 miles to Suffolk County Rte 51 northeast to Riverhead, my first drop-off stop. From there, it was NY Rte 25 two lanes, all the way to Greenport. Not bad at 5:15 am, with only five drop-off points, easy to stay on time. At 4:30 am, most times I had no passengers. Once or twice a week, I would get one to three or four riders. Note: The Road-n-Rail buses stopped at stations to drop off Pax from LIRR trains. From Greenport, we made all designated Station stops to pick up pax to Babylon only. Pax=Passengers. I was the 5:55 out of Greenport, picking up commuters, many from Shelter Island, & Greenport, Southhold, Mattituck, Aquabogue, & Riverhead. Staying on time was an unrealistic breeze, as the westbound traffic on 2-lane Rte 25 moved along at 55 to 60 Mph, all the way to Babylon Rail. Upon leaving Riverhead, it was a clear sailing south on County Rd 51, & west on Sunrise Hgwy. 95% of the time I would get to Babylon ahead of time. My riders were happy, as they could catch the “Seaford Express” which left 15 minutes before their scheduled local train. The Bad part: I cannot say the same for my next round trip to Greenport which was an absolute disaster. 8:45 out of Babylon, and 10:19 out of Greenport, never happened. The connecting train from NYC, was always late due to LIRR westbound trains having priority over eastbound trains. Leaving Babylon 15 to 20 minutes late put me 20 to 30 minutes late in Greenport. On a good day I would get out of Greenport around 10:45. By that time of the day, traffic on (2 lane) NY 25 was horrendous, with tourists, farm wagons, and tractors, etc. The scheduled 10:19 from Greenport, never happened while I had the run. I seriously doubt anyone else got out of Greenport at 10:19 either. My License was more important to me than the LIRR’s impossible to adhere to schedule. Most days I would arrive Babylon at 12:50 nearly 1 hour late. A few unhappy riders. I drove this route during July, & August 1974, and picked it again for the Fall/Winter pick, from September through December. Daniel Marra, Sr. The first batch of 35ft suburban coaches were purchased new by Schenck Transportation for Huntington Coach. Schenck was part owner of HC. 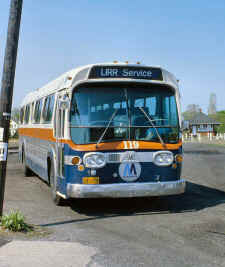 LIRR publicity photo of bus #371 at Huntington Station displaying a 1964 World's Fair destination sign. While it may have been the initial intent, Road n-Rail service was never offered to the NY World's Fair. 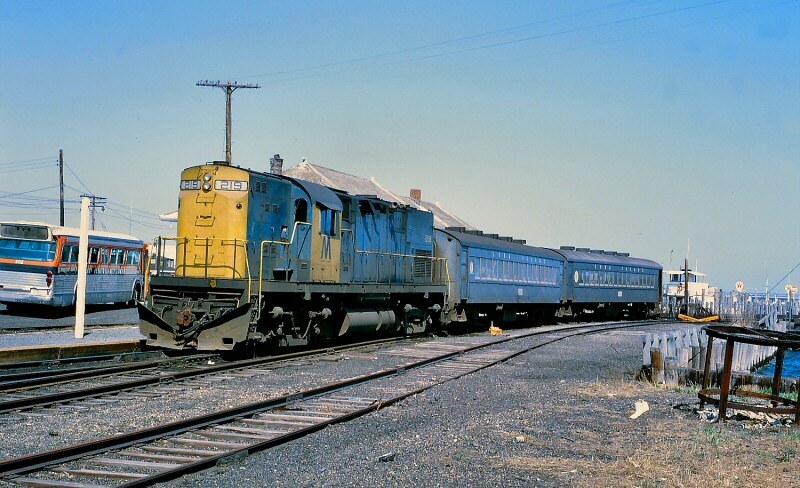 In Part I, I stated: “My first trip from Greenport to Babylon was a breeze.” Leaving Riverhead (the last pickup point) on time allowed me to arrive at Babylon a few minutes earlier than the schedule indicated. My passengers were happy as they were able to catch the earlier “Seaford Express”, instead of the next scheduled Local train. Correct me if I am wrong here. 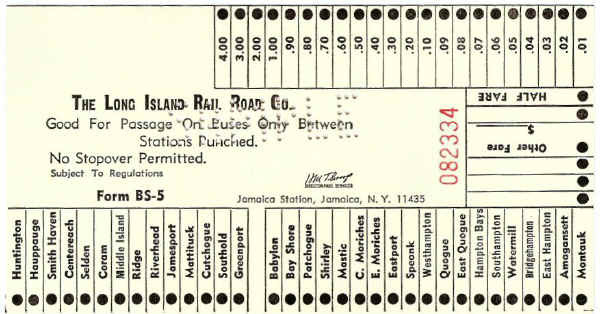 The Seaford Express made all stops to Seaford, then ran non-stop to Jamaica, then non-stop to Penn Station. This was a better choice than the All Stops Local 15 minutes behind the express. Note: Some of my daily riders told me about the Conductors not accepting their tickets from the buses. The Trainmen were charging them extra money for buying tickets on the train instead of from the Babylon Station Agent, which was open. I found out that the conductors on the later train received additional pay for accepting the bus tickets, and only charging the extra fare that was due. The two Conductors warned me; “There would be trouble if: "I did not comply with their request! !” I informed the two gentlemen: “I don’t work for you, and you need to have your Union delegate, and/or your Supervisor call my boss and straighten this out.” I will be here tomorrow, at the same time. The next morning, as I pulled into the driveway at Babylon station, I was greeted by about six to eight irate conductors blocking the driveway. The LIRR Police and a Supervisor were also there, to keep order. Due to my bus blocking the driveway, traffic behind me backed up quickly, bringing Suffolk County PD to the scene. I honked the horn and told the conductors to let me move to the waiting room. With that, two Lawyers on my bus told the Conductors if they did not let the bus move up to the station, they could and would be charged with unlawful imprisonment, detention without a warrant, and a few other charges. 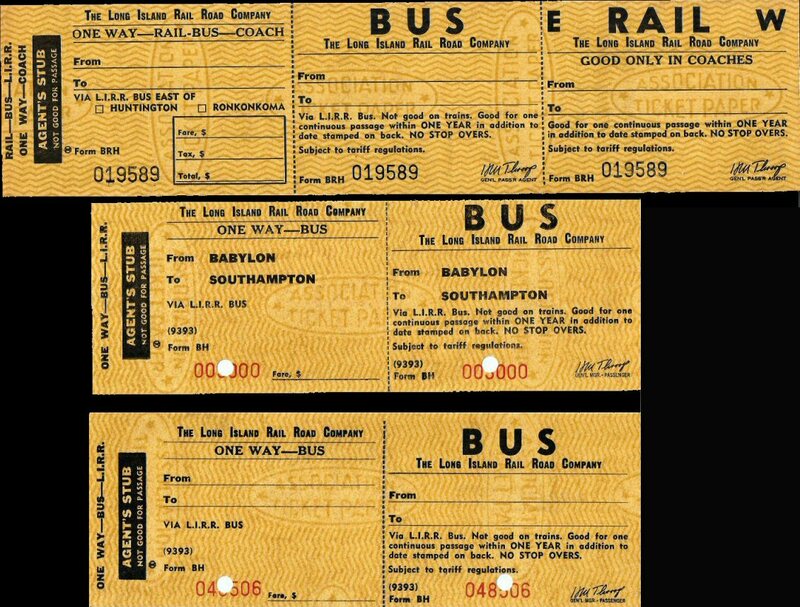 The outcome was that any conductors on the Seaford Express handling bus passengers tickets, would receive extra pay. Problem solved and everyone was happy!! Just another fine day in the country. Daniel Marra, Sr.
SPECIAL, indicates In Service on a special run/assignment. 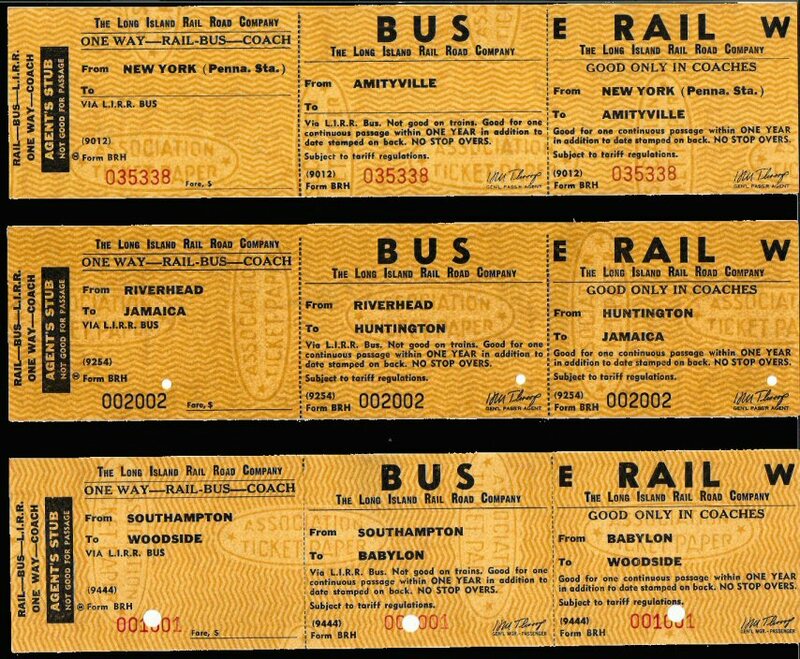 For example; not all of our buses had Greenport, Babylon, Montauk, signs due to the fact they were never used as “Line Buses.” #702 & 703, were ex-Bee Line buses used mostly on Charters, and therefore did not need other signs. If I remember correctly, the ex-Bee Liners, had only Charter, Express, & Special on their sign curtains. Charter = Bus is rented by groups of people for the purpose of outings, i.e., Baseball & other sporting events, picnics, theater groups, other “Buses Are Fun” trips etc. Special = Buses on Special assignment like carrying Baseball, Football, Hockey, teams to and from their hotels to arenas. Nassau County used MSBA buses transporting Police Officers to Parades, Funerals, and other important functions. 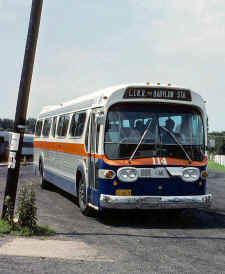 Express = Buses used on line runs to carry commuters from Hicksville to Flushing or Jamaica for example. When the LIRR has a major delay on one or more of its lines, Station Announcements’ advise passenger to board waiting Special, or Express buses at the station to other non-affected LIRR stations or Jamaica Subway. To answer your question regarding Huntington Coach. 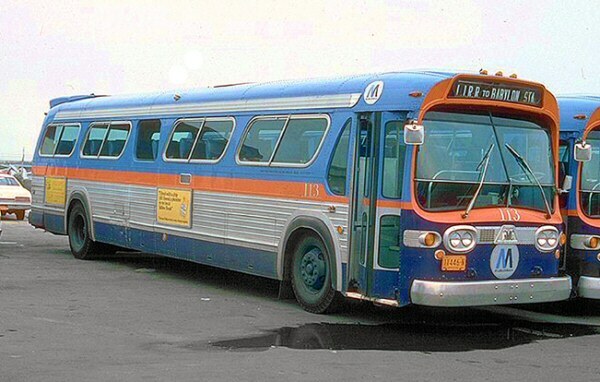 When MSBA took over operations of all Nassau bus routes, Huntington coach was not included, but the MTA-LIRR terminated the Road n' Rail contract, and decided to run their own buses using MSBA buses and drivers. As it turned out, some paper shuffler at MTA HQ forgot that MSBA had no coaches or suburban buses needed on those two routes. 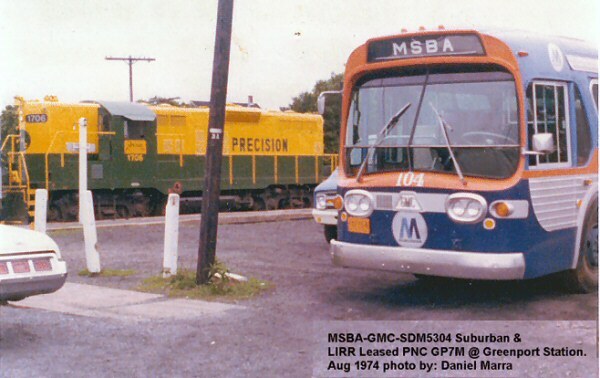 MSBA had to contract with Schenck to operate the Road n' Rail service until MSBA got delivery of new GMC Suburban’s. 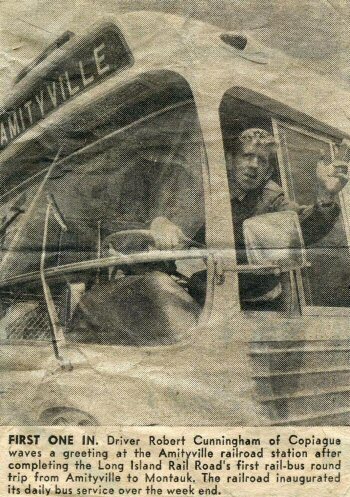 As for the Huntington Coaches GMC buses, the following list of Huntington Coach Transit, & Suburban Coaches, compiled by my good friend & fellow bus driver Fred McGullam, Motor Bus Society secretary depicts where the buses went. service. None of these old Classic buses have been preserved. 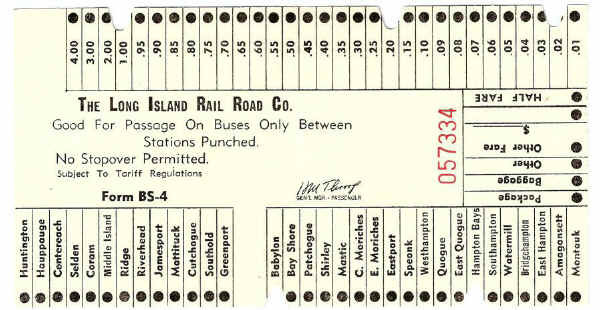 with the May 22, 1966 Summer LIRR timetable. I used a May 1970 timetable for revised bus stops. I also decided to add the Main Line Road N' Rail route for extra information about this topic. The Riverhead-Greenport Road N' Rail bus route western terminal was the Huntington LIRR Station. The scanned cash fare receipts tell the story of how the service was initiated and was modified over the years. 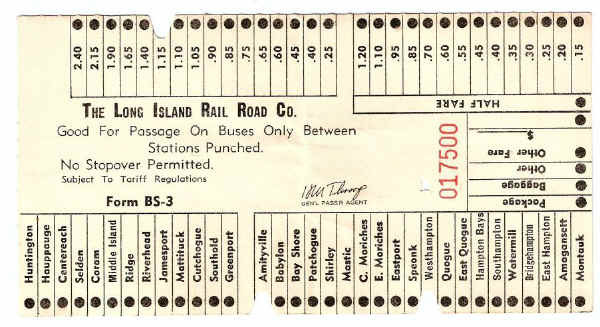 Form BS-1 shows the initial service points from Huntington to Greenport, including non-railroad related stops at several mid-island points (e.g., Ridge). 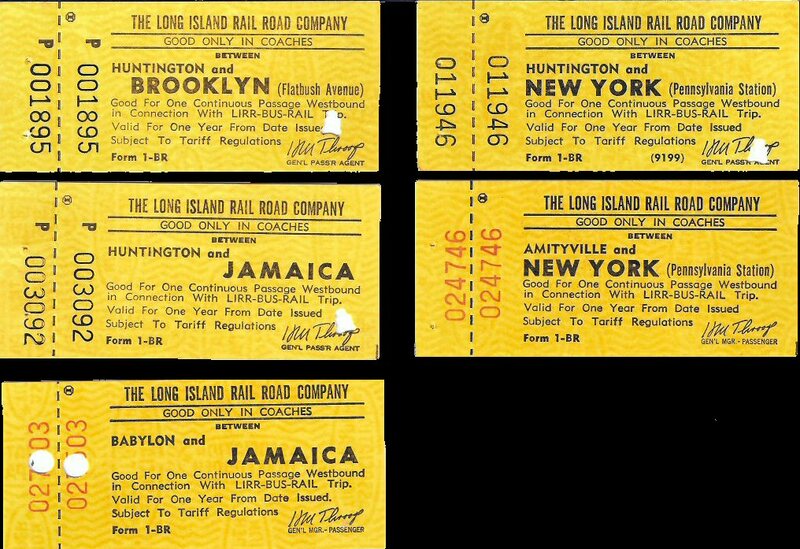 The date I have for the first run is April 7, 1962 (see first day ticket sold in Jamaica that day). 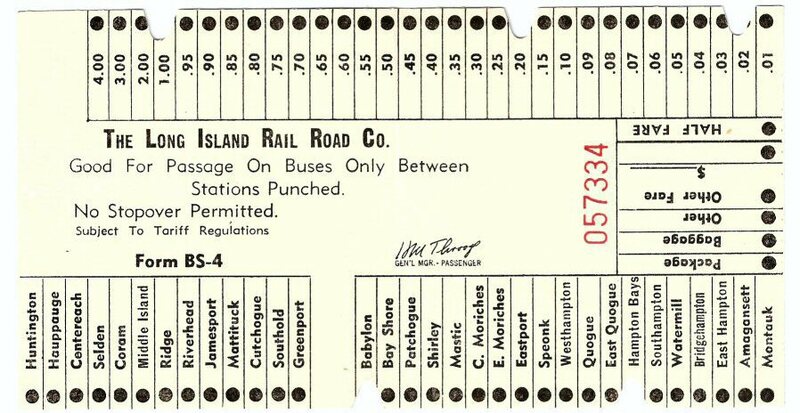 Form BS-2 (the scan is of my ticket for the first run on June 8, 1963) was used for the South Shore service to Montauk including stops at abandoned rail stops Eastport and East Moriches. 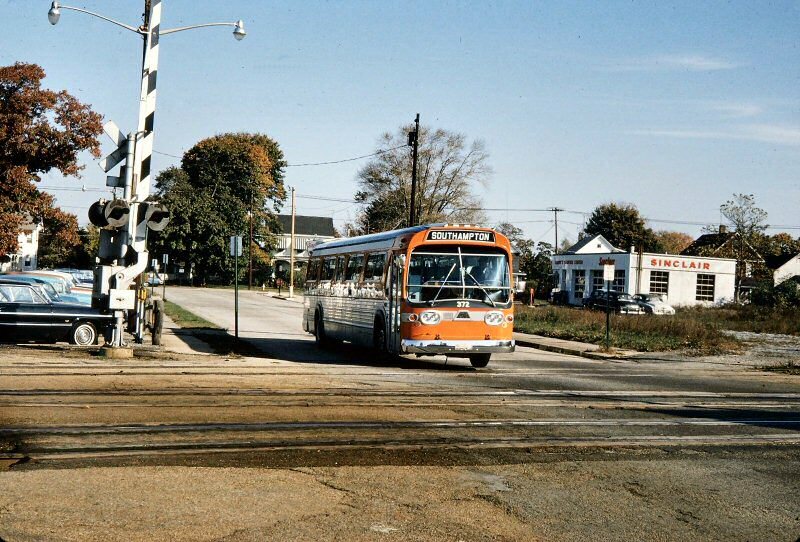 The railroad couldn't use Babylon as the (logical) transfer point due to the grade crossing elimination work in progress so Amityville was chosen for its large parking lot (for bus maneuvering) and propinquity to Sunrise Highway. 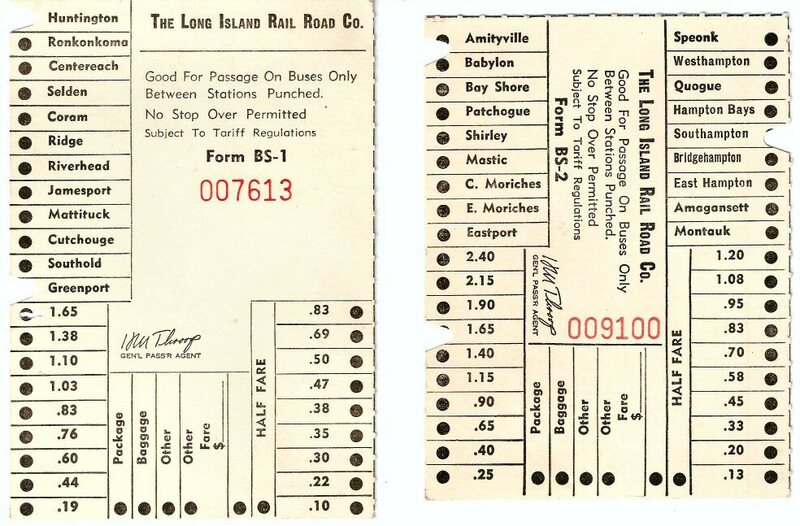 See scan of my first day tickets purchased at Amityville and Southampton. 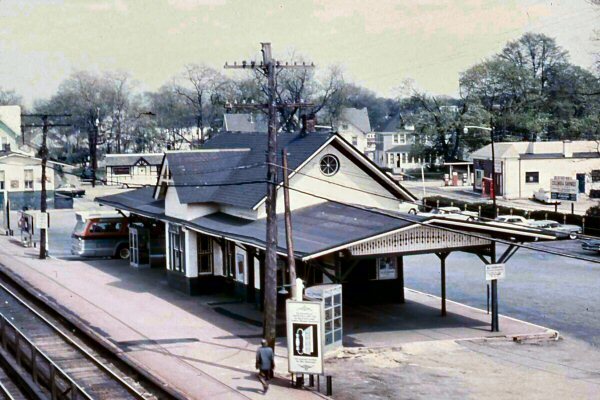 In June 1964, stops were added at Hauppauge and Middle Island on the Greenport run and Watermill on the South Shore. 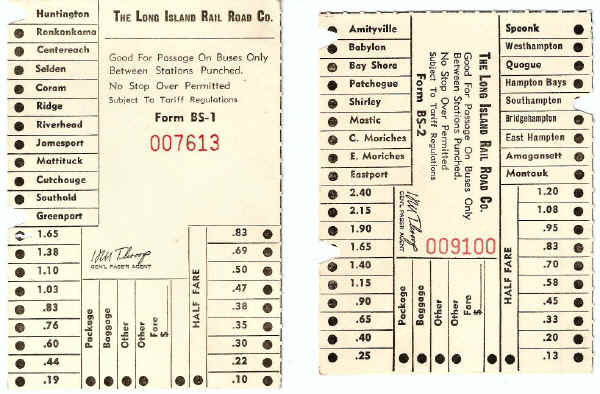 In issuing updated cash fare receipt forms, the railroad combined the north and south runs on one form (see BS-3). 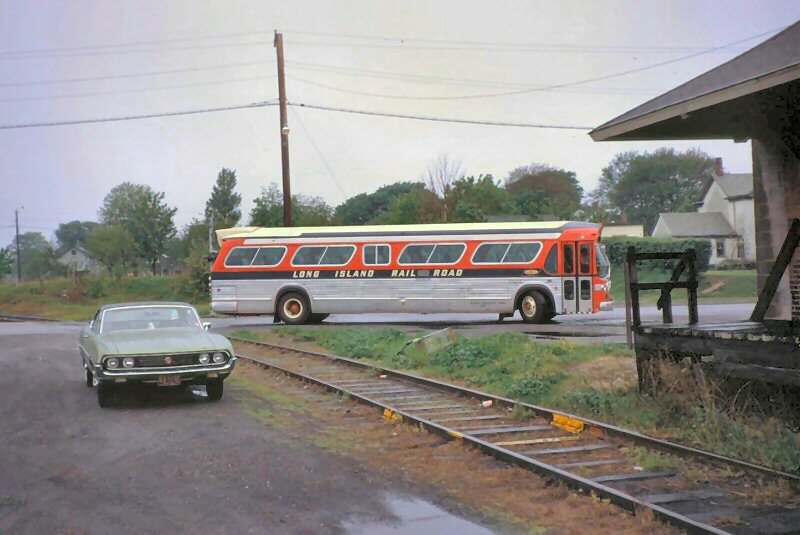 With the completion of the Babylon elevation and Amityville's now in progress, the railroad moved the transfer point for the Montauk busses to Babylon in 1967. Form BS-4 was issued to reflect that change. 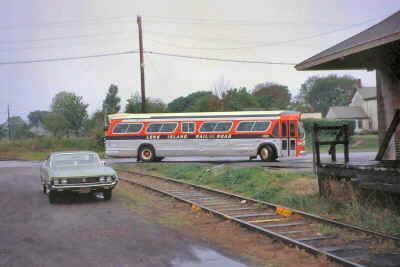 In 1969, the Smith Haven stop was added on the Greenport run so Form BS-5 was issued to add that stop. between some of those spots). 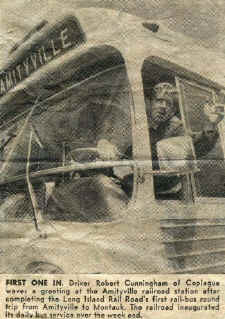 I know that Huntington services were moved to Babylon and that the busses were eventually eliminated. 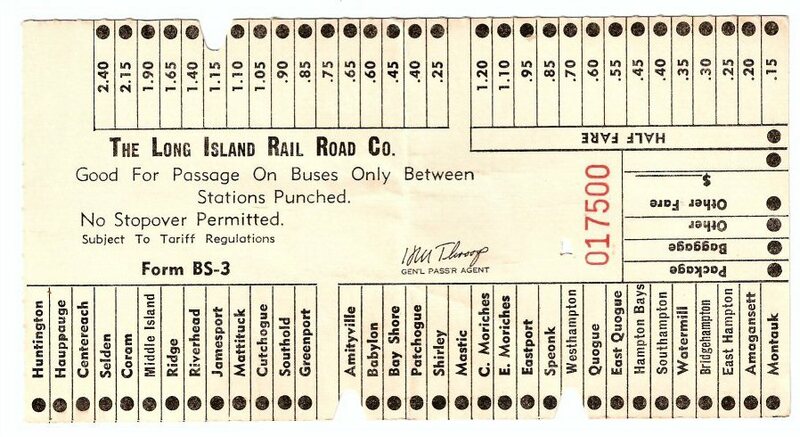 The open form of rail-bus tickets (see scan) had an option to route via Ronkonkoma as well as Huntington though I can't recall ever seeing that ever used in practice. For passengers boarding busses at non-rail stations, the bus drivers sold rail tickets to Jamaica, Brooklyn and New York (only) from pads clipped to the dash (see scans); no date validation was made. 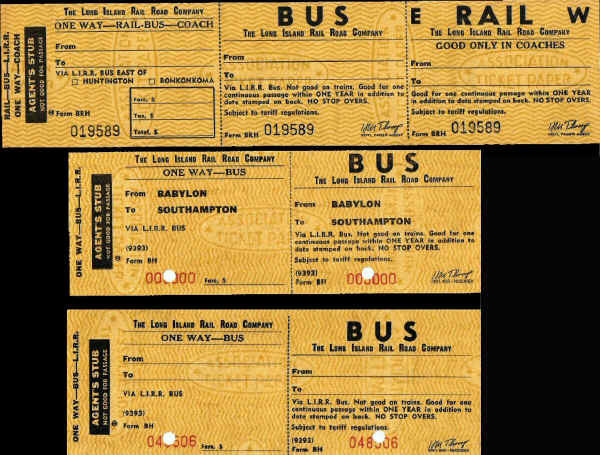 In the 1970's, the large forms were replaced by smaller size tickets (see scan) similar to the 1H and 1BH rail forms. Road-n-Rail is an interesting chapter in LIRR history, I emphasize interesting, as it was not a good time frame for East End service. 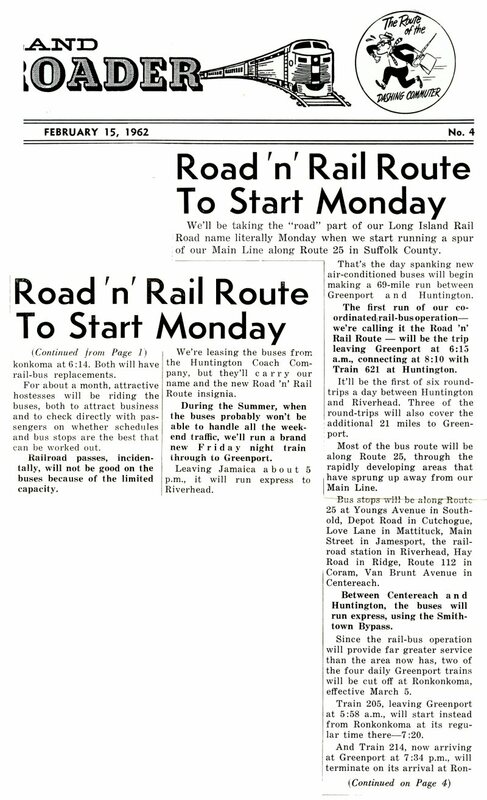 Road-n-Rail was born from the LIRR, like most railroads, loosing their postal transport contracts by the mid-60's. Carrying mail was one way to justify some of the east end services. 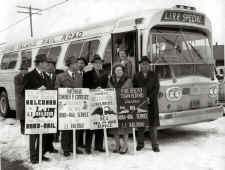 With the mail contracts gone, bus service was one way to continue service to eastern stations. However, with the reduced train schedules came reduced maintenance, and extended trip times. Yet, Road-n-Rail was becoming self defeating since areas of central Suffolk started to develop, and the busses started to have problems keeping to schedules. 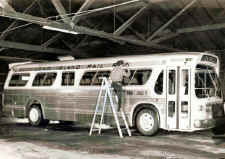 This was also the time frame when the Hampton Jitney started up as a village to village shuttle, but quickly discovered their Hamptons to Manhattan service was fast becoming popular, so popular that they dropped the village to village shuttle to focus on it, and it developed into what we have today. All Info/photos courtesy of: Daniel Marra, Sr. unless otherwise noted.